I have been fascinated with the word Bundt for a long time. The first time I really heard it, thought about it as a word, was the first time that I watched My Big Fat Greek wedding a few years ago. At that time I marvelled at the absurdity of it as a word, the ludicrous spelling and the ridiculousness of trying to get a ‘d’ and a ‘t’ out of your mouth in immediate succession. Then about 6 months ago when my baking obsession stepped up a notch, and I read Joy The Baker’s blog post on a Big Fat Chocolate Bundt, I realised that I had never, ever made any type of bundt. Never! Ever!! So I went online to good old amazon and bought myself a pretty (and) substantial bundt tin. This tin then proceeded to sit on one of my kitchen overflow shelves until about 2 weeks ago. That was when an innocent re-run of My Big Fat Greek Wedding brought back the desire for a bundt. Big time. 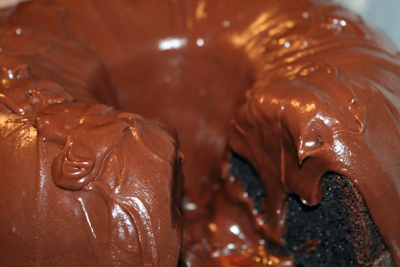 So I retrieved it from the dark corner of the shelf that it had been relegated to and dusted it off, and discovered the most moist and delicious chocolate bundt cake in the world. This cake combines all sorts of lovely things. Sugar, cocoa powder, eggs, a cup of oil… a CUP of OIL?! Really?! (was what I was mentally exclaiming to myself). But I managed to take a deep breath, put my faith in Joy, and the rather fickle baking gods, and poured it in. The whole darn cup. Sheeeeesh. Now I do have complete and utter faith in Joy. If she said that this recipe is a winner, then I believe her, but I was nonetheless scared by this batter even once I was over the cup of oil trauma. The batter was very, very runny. Like drinkable runny. Like no-way-in-hell-will-this-ever-turn-into-a-cake type runny. The recipe did warn about this and said not to worry, but honestly, it does seem against all the laws of baking physics that a substance can go from being very liquid, to a divine slid in just an hour under the magical influence of the heat of my oven. But it did. And it was amazing. I don’t know if it was my over-zealous fan-assisted-(assisted??) oven, or whether I whisked the mixture too long or too fast, but my bundt rose. Boy did it rise. A lot. A heck of a lot. I was genuinely concerned as to whether I would get it out of the tin, and if I did, what on earth would it look like, with the pretty cakey pattern from the tin balanced on a mound of formless cake that was a good inch above the edge of the tin. 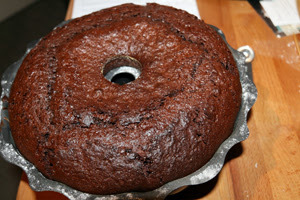 But not to worry, once I had turned the dear bundt out of its tin and onto a cooling rack, it did settle down a bit. It wasn’t a perfect looker, but who cares with a taste like that. I have to now spare a thought for the glaze for this cake. It is simply a small taste of heaven. If you could eat the pearly gates, they would taste like this glaze. It is divine. Be warned though, the below recipe makes about double the amount of glaze that you actually need to coat this cake, so unless you plan on eating chocolate glaze by the spoonful or using it as an ice cream sauce (I can testify that this is a noble function of this delectable elixir), halve the recipe. That will give you plenty to glaze the cake, which in all honesty could stand up strongly by itself without any glaze at all. To make the cake batter: Put brewed coffee and cocoa powder in a small saucepan and bring to a boil, whisking frequently. Remove from the heat and let come to room temperature. In the bowl of a stand mixer fit with a whisk attachment, mix together sugar, salt, baking soda, eggs and egg yolk on low speed for about 1 minute. Add the buttermilk, oil and vanilla extract and mix on low again for another minute. Add the flour and mix on medium speed for 2 minutes. Add the cooled cocoa mixture and mix on medium speed for 3 minutes. The batter will be very runny – its ok – its meant to be like that – don’t panic. 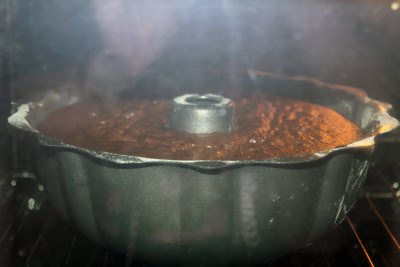 Pour into the prepared cake pan and bake for 1 hour, or until a cake tester inserted in the cake comes out clean. 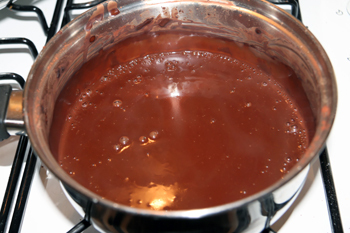 To make the glaze: Chop the chocolate into small pieces, put them in a heatproof bowl (or a double boiler), and set the bowl over a pot of barely simmering water. Be sure that the bottom of the bowl does not touch the boiling water. 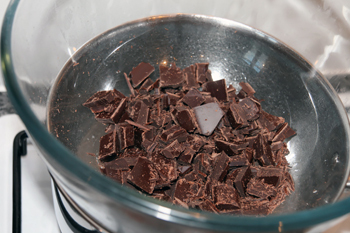 Remove the bowl from the heat when all of the chocolate bits have melted. 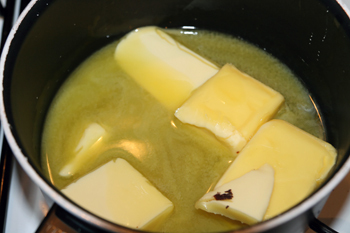 Melt the butter in a separate pan or in the microwave. Whisk the melted butter into the melted chocolate until thoroughly incorporated. Sift in half of the powdered sugar. Add the sour cream and whisk to combine. Sift in the remaining powdered sugar and whisk until smooth. The glaze should be thick and shiny. Lastly, add the coffee and whisk to create a glossy glaze. 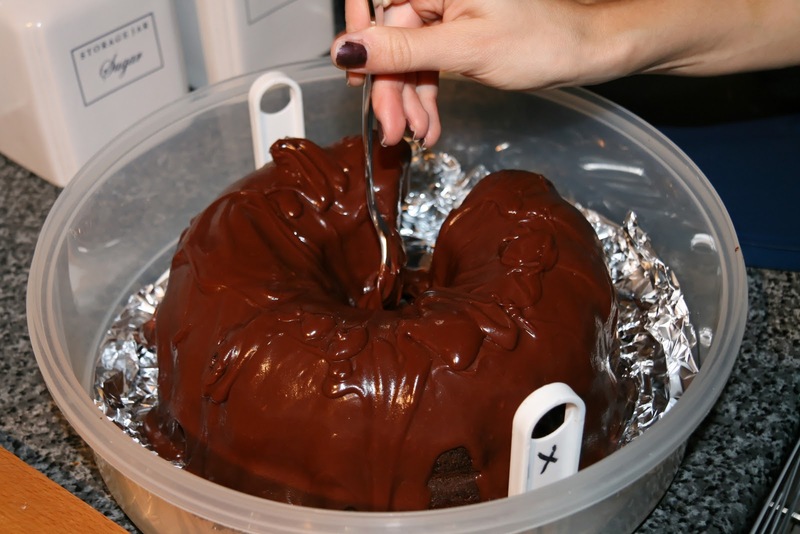 Pour the glaze over the Bundt cake, covering it completely. Leave at room temperature until ready to serve.